In our household, it should be a surprise if I'm not having a huge smoothie or a bowl of oats for breakfast -- it's always an either-or kind of situation. 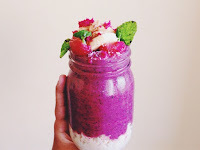 But that one morning, before heading to yoga, was an exemption; I combined my two favorite breakfast preparation methods in one fabulous recipe -- a treat of a jar loaded with fruits, greens, fats, fiber, protein and YUM. I know a handful of people who can be such grumpsters in the morning but maybe a gorgeous breakfast like this is the fix. Pretty meals always end with a smile, and this is only one of the many ways you can pretty up breakfast. I'll make sure to post some more ideas in the future, in case you'd want to recreate a jar like this with your own variations. And also, because I'm rooting for you and I want you to. May your mornings be always be healthy, inspiring, and delicious! Soak the oats in almond milk and freeze the fruits overnight. The next morning, create the smoothie layer by blending the frozen berries and banana coins, beet juice, flax, spinach, and 1 tbsp of almond butter. Pour smoothie over the oat layer. For the toppings, I used banana coins, chopped strawberries, mint leaves, desiccated coconut, shaved beet and a dollop of almond butter.